Today the High Representative, Valentin Inzko, welcomed Michael Scanlan as the new Principal Deputy High Representative and Brčko District Supervisor. “I am pleased to welcome Michael Scanlan as my Principal Deputy at the Office of the High Representative and as the new Brčko District Supervisor. The nomination of a distinguished and experienced diplomat such as Mr. Scanlan is a testimony to the United State’s ongoing commitment to the stability and prosperity of Bosnia and Herzegovina and the implementation of the Dayton Peace Agreement. I am confident that together with Mr.Scanlan, and in coordination with the wider International Community, we will help this country and its citizens build a better future,” the High Representative said. 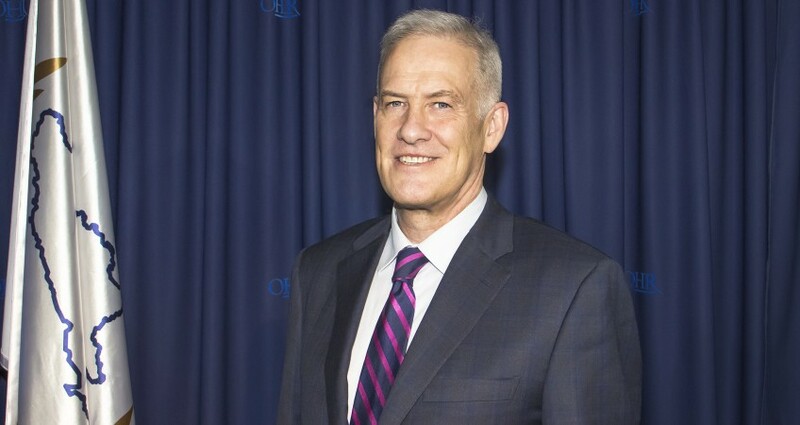 Prior to arriving in Bosnia and Herzegovina, Michael Scanlan served as the Head of the OSCE Mission to Moldova and the OSCE mediator for the Transnistrian Settlement Process (August 2014 – August 2018). During his 28 years with the U.S. State Department, his assignments included the position of Director for Eastern European Affairs in Washington, Charge d’Affaires a.i. at the U.S. Embassy in Minsk, and Pearson Fellow on the U.S. House of Representatives Committee of Foreign Affairs. Mr. Scanlan has had extensive experience in the Western Balkans and the post-Soviet countries, including serving in Ukraine, Armenia, and Kyrgyzstan as well as in Bosnia & Herzegovina and Montenegro, and in Croatia with the UNTAES Mission.